I'm sure at some point in everyone's life, you imagine that you can throw fireballs out of your hands like you're a wizard, superhero or Ryu and Ken from Street Fighter. Well imagine no more! You can now buy a wrist-mounted device that lets you fling fireballs around to your hearts content. 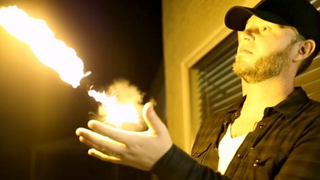 The Pyro Fireshooter by magician Adam Wilber is sold by Ellusionist, and is a wrist-mounted launcher with four barrels in which you can load little flashpacks packed with paper and Nitrocellulose, which get shot out and burn up, giving the effect of you throwing a fireball out with a flick of your wrist. The device is operated by remote control, so it can be fired either by the person wearing the Pyro or by someone 30 feet away (who doesn't want to be attacked by someone wielding a fireball launcher, probably), and - well, actually are you even still reading this? I bet you got to the link to buy the damn thing because IT LETS YOU SHOOT FIREBALLS OUT OF YOUR WRISTS. And at $174, it's surprisingly not that pricey - especially to fulfil a childhood dream like that. Just, you know, for the love of god try not to actually set either yourself or anyone else on fire with it. We wouldn't want to get the Pyro banned because someone went and tried to be a pyromaniacal supervillain with a few of them, would we?